Does economic reform inevitably lead to political change? The NYT's Deputy Foreign Editor Marc Lacey and Harvard University’s Jorge I. Domínguez discuss whether Cuba can continue to evolve economically, but stay the course politically. Today, Luis Eligio D'Omni & Amaury Pacheco, two members of Omni-ZonaFranca paid me a visit in my office at Baruch College. Completely by chance, their visit coincided with that of Enny Pichardo, a reporter from NTN24, who had come to interview me about the Pope's visit to Cuba. Although he had come to get a sound-byte from me, he asked to interview Luis Eligio and Amaury also, who were more than happy to oblige. As you can see from the clips I made with my iPhone below, his exchanges with them were much more fruitful and powerful than anything I could say. My commentary came primarily from the head, while theirs came as much from the heart as the head - y sin pelos en la lengua. Each of the two quick, 8-minute interviews is quite moving and shows the valiance and intelligence that make Omni so fascinating and unique. Just imagine, Cubans talking of Gandhi and St. Francis of Assisi, instead of politics and nationalism! 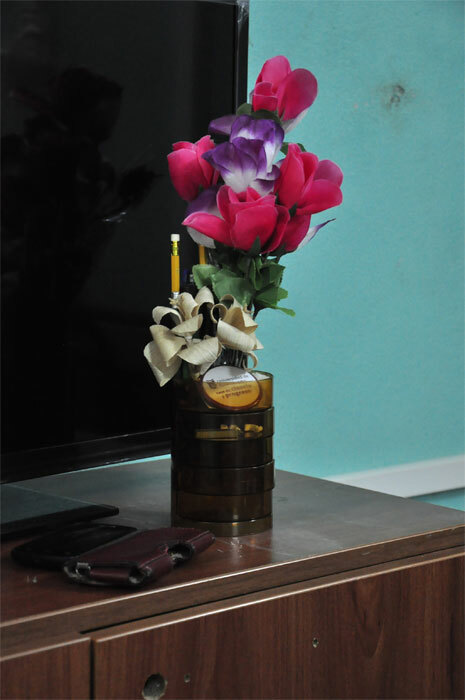 For NTN 24's version of the interviews with brief clips of each of us, see here. Luis Eligio (This video now has English subtitles). I'd also like to point your attention (if you read Spanish) to a penetrating interview that the Cuban-American academic and musician, Maria Isabel Alfonso, did with Amaury Pacheco. Alfonso attended their first show in NYC last Friday at Baruch and also wrote a short review that introduces the interview. She really captures their gracious spirit and unique, open-hearted approach to Cuba's dilemma. 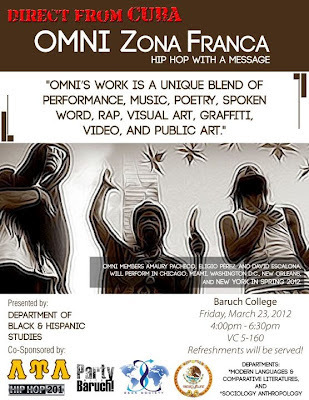 Finally, OMNI will be at NYU's Kimmel Center (Room 802), part of the Center for Latin American and Caribbean Studies (CLACS), today, Wednesday, March 28, from 7:30 p.m. - 9:00 p.m. (60 Washington Square South) presenting yet another variation on their show, "Mákina Total City," this time co-sponsired by NYU's Cuban American Student Association. They will also be a NuBlu with DelExilio this Thursday night @ 9:00 p.m. If you happen to live in any of the cities remaining on Omni's first-ever U.S. tour (three shows this week in NYC; Friday in Providence, RI; Washington, DC, April 1-10; New Orleans, April 11-30; and Miami in May), I urge you to check them out. Their show is sure to blow your mind with a sampling of the little known world of independent Cuban art, music, and poetry. Last Friday night, March 23, they presented an amazingly original and moving show at Baruch College that was enthusiastically received by the diverse audience of students and guests from across the NY metro region. 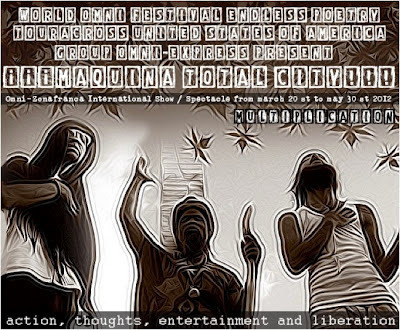 It included a seamless flood of evocative, provocative images; powerful poetic expression; percussive sound made on three ancient Cuban typewriters; ecstatic dance and movement; and their own special brand of hip hop they call "free hop." 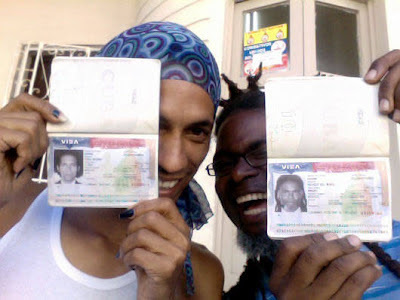 The three members of the group, Luis Eligio D'Omni, Amaury Pacheco, and David D'Omni, use a poetic, performative, artistic language, in a spirit of the search for truth, engagement with the public, and open dialogue very different from the overheated polemics we are used to hearing about Cuba. As Rolando Pulido writes in Spanish here, they bring much light to the public without any of the heat and hate we often find accompanying Cuban issues. For a few brief previews of their current show, "Mákina Total City," take a look at these three clips/video montages from Friday night's show and one rehearsal on Thursday (2 minutes each above and 9 minutes here below). 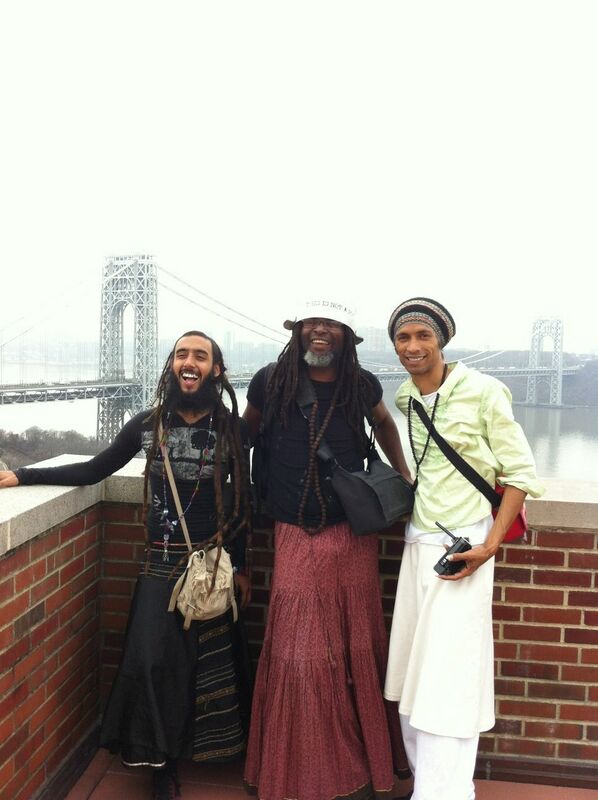 Members of Omni-Zona Franca, David D'Omni, Amaury Pacheco, and Luis Eligio D'Omni on the roof terrace of my co-op "In The Heights" (Washington Heights) with the Hudson River and the George Washington Bridge in the background. So, yesterday at long last I finally met the three members of Omni-Zona Franca, David, Amaury, and Luis Eligio, who are touring the U.S. this spring and who will take Baruch College by storm tomorrow. The event is free and open to the public and would be a great way to start your weekend with a mind-bending bang! There will be music, poetry, and Q&A. We will also be serving refreshments (Latin fare) so please go to the event page at Facebook and rsvp so we can get an accurate head count so there is enough food! Together, Zoya Kocur and I introduced the guys to the finer points of the NYC Subway system, the flowering springtime parks of Northern Manhattan, as well as some of the city's vertical architecture. They also marveled at the views of the GW Bridge and the Palisades across the Hudson River. Late in the day, we met up again at the Gandhi Statue in Union Square where we also very appropriately witnessed the "Million Hoodie March" protesting the killing of Trayvon Martin. To their great pleasure I also introduced Omni to the professor and performance artist Coco Fusco - whose work they know and admire greatly. However, an incomparable day soon morphed into an unforgettable night as we made our way down to the Lower East Side's Nuyorican Poets Cafe. Luckily, we got there just early enough to sign David and Luis Eligio up as 2 of the 20 poets that would compete in the evening's poetry slam. 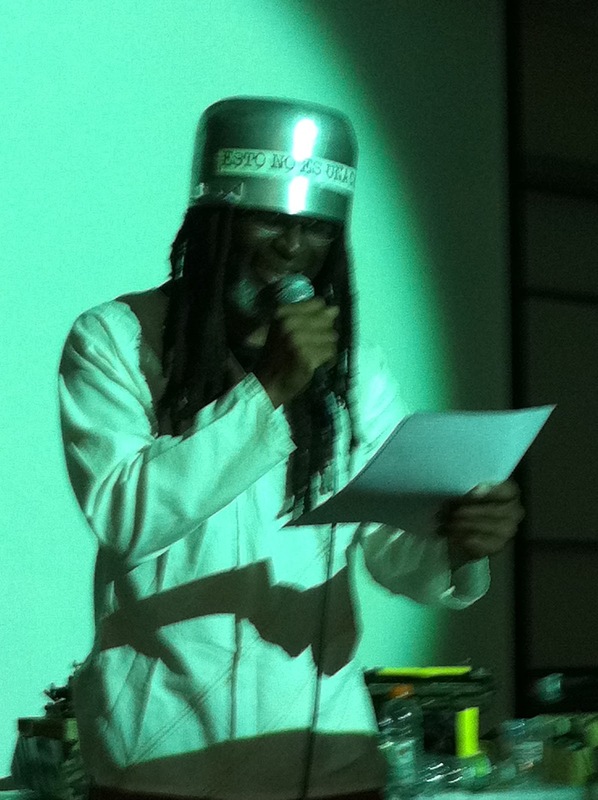 And, as luck would have it, the only spots left were the opening and closing acts - so all comers were treated to a night that began and ended with the magical potion that these multi-disciplinary poets brew back in Alamar and have brought to share with us in Nueva York! See below for my amateurish Flipcam and iPhone videos of their performances. As you can see, each of them slowly won over the crowd with their earnest presence and passionate palabras. This special talk will be in Spanish! If Cuba needs a [tech] revolution, who should be its revolutionaries? "Wow! This sounds like it will be very interesting. However, I still think the best (and easiest) thing we can do to achieve greater freedom in Cuba is end the travel ban and get rid of the embargo. This won't end the Cuban government's internal embargo but I think it will make it much harder to enforce and remove their favorite whipping boy and scapegoat from the chessboard (if I can mix my metaphors)." Luis Eligio D'Omni, Amaury Pacheco, and Alina Guzmán D'Omni. The interview was done by Yoani Sánchez almost 4 months ago on November 30, 2011 in her Havana apartment and published on her blog, Generation Y, on December 5 as part of the lead up the the 2011 Endless Poetry Festival (Poesía Sin Fin). Luis Eligio and Amaury will arrive in New York later today - along with the third member of their crew, David D'Omni (highlighted in my previous post) - to continue the next leg of their 3-month U.S. tour. Bienvenidos a La Gran Manzana! In preparation for the arrival of OMNI-Zona Franca to New York next week, I have been perusing the seemingly endless selection of videos they have uploaded to YouTube. In fact, apart from their blog, they have not one but two different "channels" on YouTube here and here. As a way to familiarize my readers with OMNI's unique, genre-busting, and amazingly creative, honest, and challenging work, I'm starting with David d'Omni, who strikes me as the most "revolutionary" of these three "new men" - and that's saying a lot if you've seen any of them in action. I keep trying to think of analogies, like "a white Cuban hip hop version of Bob Marley," but such comparisons really only insult the unique spirit and originality of both artists. What would it look like to be a truly rebellious, independent, critical-minded artist in a supposedly revolutionary society? As words fail to capture what I mean - I suggest that you watch these four short videos and see for yourself. 1. "Evolucion" by David D'Omni. Abre los portales, Que corran los tiempos. No somos inmortales, Tus hijos crecieron. [Open the portals, Time is running out. Este es su momento, Ya les toca a ellos. Lo que traen es bello, No lo teman a lo nuevo. [This is their moment, Now is their time. Vengo fresco, Soy de esta generación. No somos malos, na! Venimos a buscar lo nuestro. [I come fresh, This is my generation. No llores papá, No te vamos a quitar na! Es un ciclo natural, Eso sucede en todos los tiempos. [Don't cry father, We're not going to take anything from you! Amen, Amen; Aché pa' los nuestros. 2. "Terapia y Oracion" by David D'Omni. 3. "Free Hop Musik" by David D'Omni. 4. "Creo en Ti" by David D'Omni. 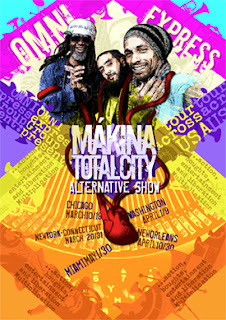 Hip Hop Hippies from Havana come to Nueva York! This event is free and open al público! 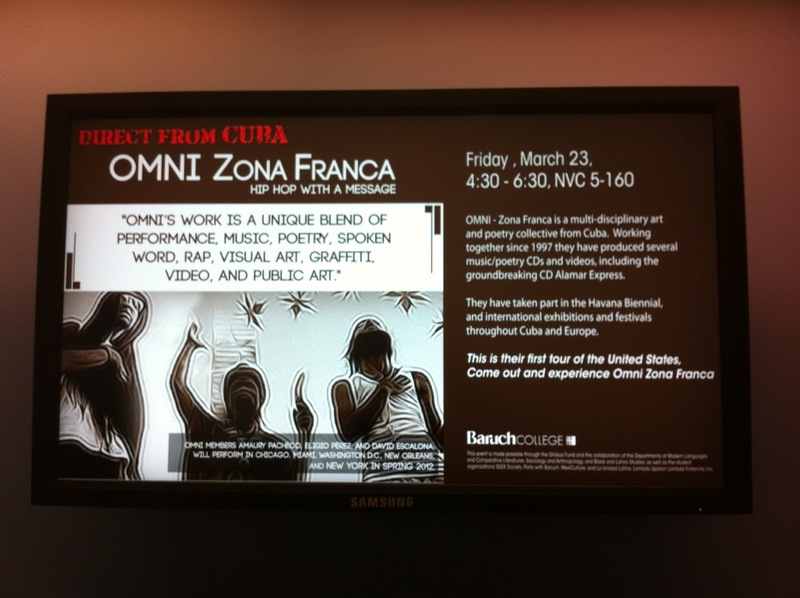 OMNI-ZonaFranca is a multi-disciplinary art and poetry collective from Cuba. OMNI members Amaury Pacheco, Eligio Pérez, and David Escalona, will perform in Chicago, Miami, Washington D.C., New Orleans, and New York in Spring 2012. 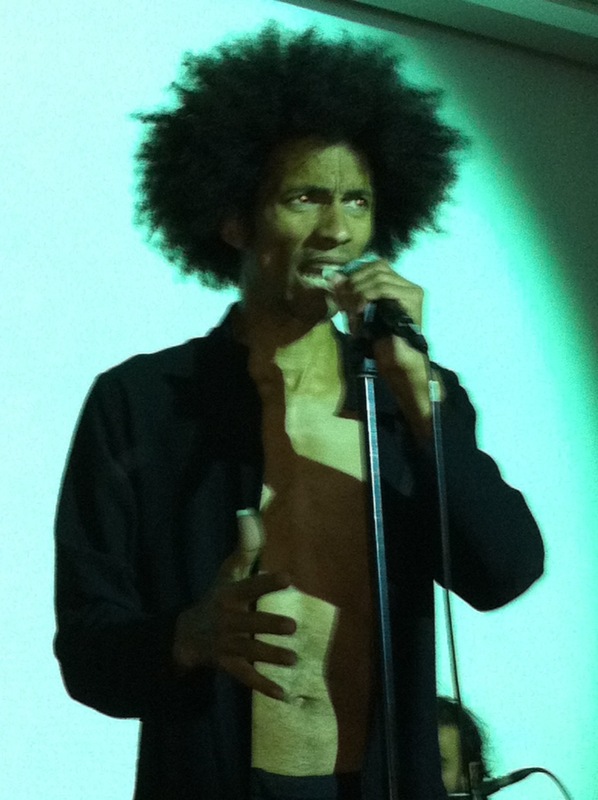 OMNI’s work is a unique blend of performance, music, poetry, spoken word, rap, visual art, graffiti, video, and public art. Working together since 1997 they have produced several music/poetry CDs and videos, including the groundbreaking CD Alamar Express. 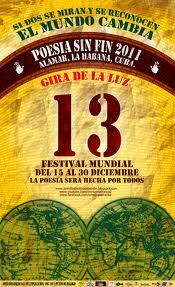 They produce the annual music, art, theater, and poetry festival Poesía Sin Fin (Endless Poetry) in Cuba. 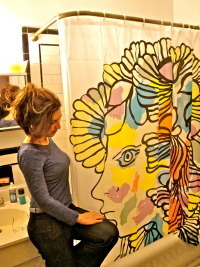 They have taken part in the Havana Biennial, and international exhibitions and festivals throughout Cuba and Europe. This is their first tour of the United States. There's has been a lot going on over the past few weeks in and around Cuba (and there's an explosion of Cuba-related activity in NYC in April). Recently, I was able to take in two fabulous films about Cuba: The animated and Oscar-nominated homage to 50s-era Cuban music and to "el maestro" pianist Bebo Valdes, "Chico and Rita." This film is the product of collaboration between the Spanish writer/director Fernando Trueba and illustrator Javier Mariscal, along with scores of their friends in Cuba, New York, and elsewhere. Check out the film trailer above. 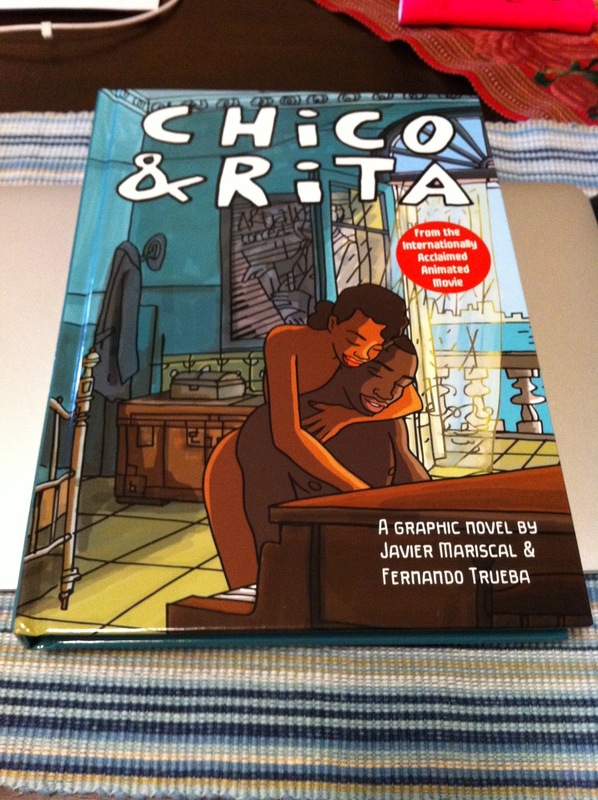 I'm also adding here a few photos I took during the film's opening in New York a few weeks ago, where I was lucky enough to get Mariscal to sign my copy of the graphic novel version of the film (that's the two of us at the book signing at Angelica Theaters in Tribeca after the film. There's also the amazing documentary, "Unfinished Spaces," by Alysa Nahmias and Benjamin Murray (pictured below with the one-of-a-kind Cuban architect Ricardo Porro) about the still-photogenic, long-suffering, and recently "re-discovered" Cuban National Schools of Art. I hear that both films have been greeted with emotional, sold-out, standing-room-only audiences in Miami AND Havana. That's not an easy feat! If either film is showing anywhere near you, do NOT miss it. 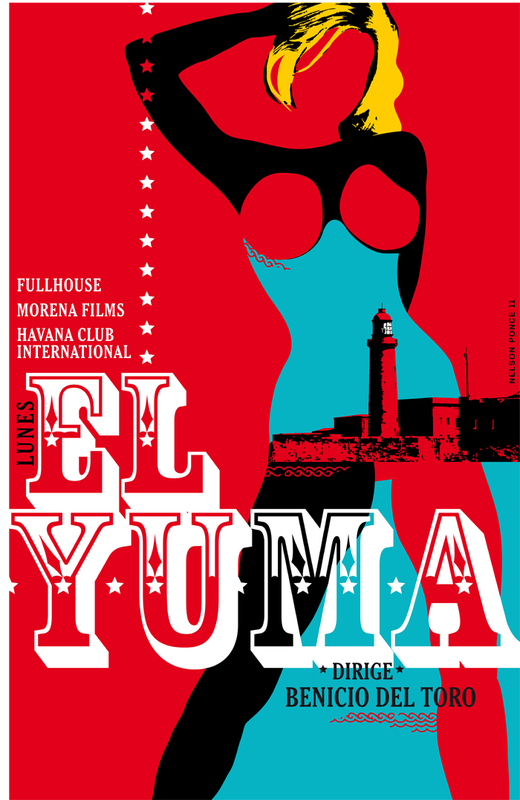 Then there are a host of great Cuban films scheduled to be shown at the Havana Film Festival (in New York) and at the Tribeca Film Festival (both taking place in April). The HFFNY opens with Ian Padrón's "Habanastation" on April 7 and closes with Alejandro Brugués's "Juan of the Dead" on April 20. At Tribeca, I'm gonna be sure to make it to these: Hard Rock Havana, Lost Son of Havana, and Chevolution. 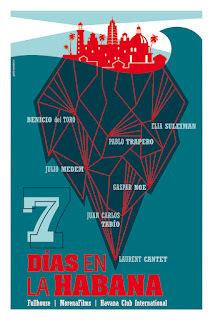 Finally, "Seven Days in Havana," the seven-part, multi-director homage to Cuba's capital city now has a sleek new website with loads of film clips and interviews and announces that the film will be in wide-release in the U.S. and elsewhere during 2012. As I have mentioned here before, the first short in the film was written by Leonardo Padura (who wrote two of the other short screenplays with his wife Lucía Coll) and directed by Benecio del Toro. 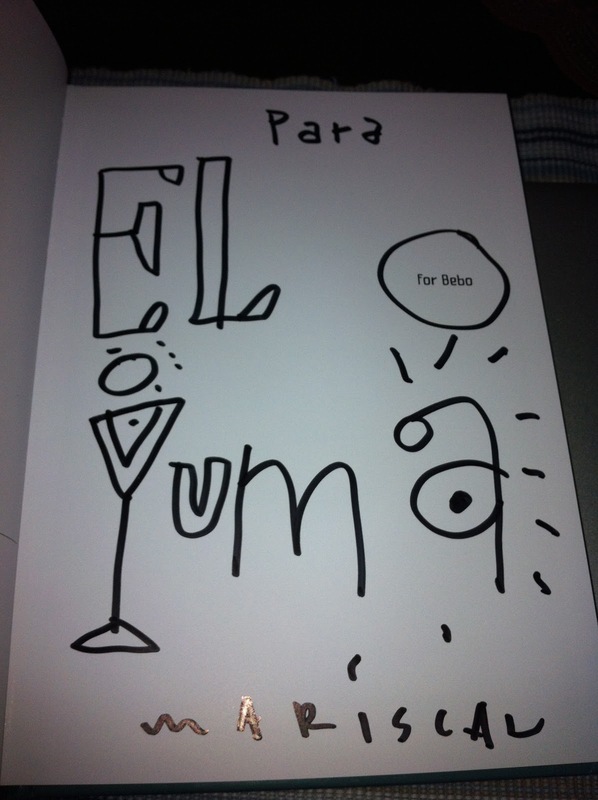 It is entitled EL YUMA! 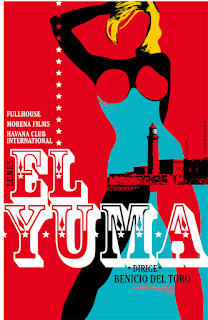 Here is the synopsis of "El Yuma" at the film's website - I swear that I had nothing to do with the title or the name of the lead character, Teddy, an American tourist in Havana. 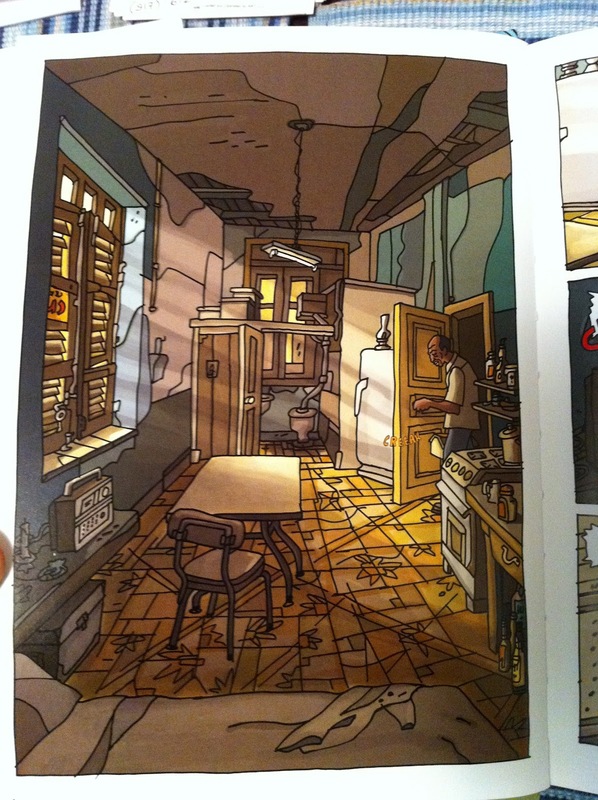 "Teddy Atkins is a young American tourist who travels to Havana for the first time. His driver, a middle-aged Cuban cabbie who has a university degree in engineering, will offer him a tour of the city that is anything but traditional." The clip below is a tour of some of Havana's many, legendary 1950's style movie theaters led by none other than Cuban novelist and sometime screenwriter Leonardo Padura. 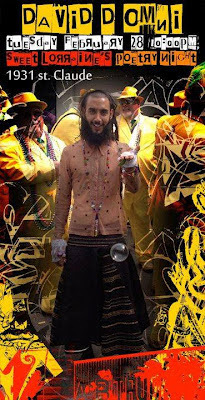 Three members of the genre-busting, multi-talented group of performance artists that call themselves "Omni Zona Franca" arrive today (Thursday, March 8) to Miami to begin a whirlwind tour of the U.S. with stops planned (so far) in Chicago (March 10-20), New York & Connecticut (March 20-April 1), Washington, D.C. (April 2-9), New Orleans (April 10-30), and Miami (May1-June1). 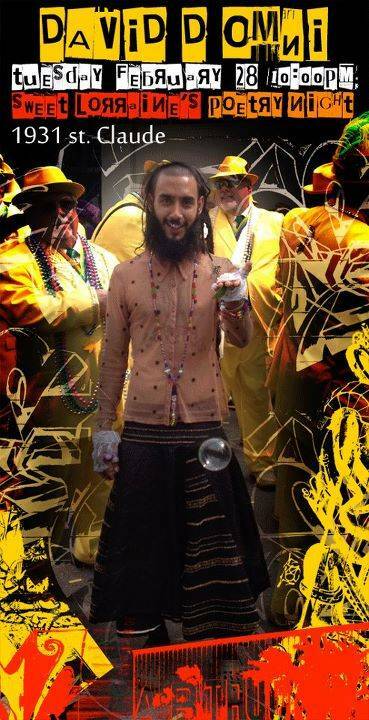 It seems that one member of the three-man touring crew, David (The Freehoper), has already been in residence in New Orleans for some time. His two partners in crime (pictured here), Amaury (The Republic Meditator) and Luis Eligio (The Diplomat) will be joining him to make the tour. Think Public Enemy with a mix of Yoko Ono and Basquiat. The 50th anniversary of the U.S. embargo against Cuba passed recently without much fanfare. However, Global Voices did us all a service by asking two very different Cuban bloggers to reflect on the "tried and true" or "tired and tragic" policy 50 years on. 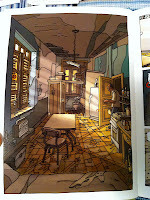 First was this reflection from Alberto de la Cruz from the Babalu Blog in Miami. And then an assessment from blogger Elaine Diaz in Havana. Official Cuban airwaves and cyberspace saw some new (and much of the same old) attacks against independent Cuban bloggers Yoani Sanchez and Miriam Celaya (both good friends of mine) at the oficialistisima site CubaDebate. Also see the responses from Yoani and Miriam. My feeling is that if the site wants to call itself Cuba DEBATE, then whenever anyone is criticized or attacked there, they should give the "attackee" the space to respond. But it seems that this Mesa Redonda, only has one side. "Every artist is a cannibal. Every poet is a thief. All kill their inspiration and sing about their grief." Jorge I. Domínguez, an acclaimed Cuba and Latin America scholar at Harvard University, discusses potentially transformative changes taking place in Cuba. Following opening remarks by New School president David E. Van Zandt, Mr. Domínguez analyzes recent developments in Cuba and their implications for the country's economy, governance structure, political system, and international relations. Jorge Domínguez is Harvard University's Antonio Madero Professor for the Study of Mexico, vice provost for international affairs, special advisor for international studies to the dean of the faculty of arts and sciences, and chairman of the Harvard Academy for International and Area Studies. Admission is free, but space is limited. Click here to register. Co-sponsored by The New School's Global Studies program and the Association for the Study of the Cuban Economy. For additional program information, please contact Stephen Kimmerling.